European Parliament. The annual report of the European Court of Auditors presented in the Committee on Budgetary Control-CONT. 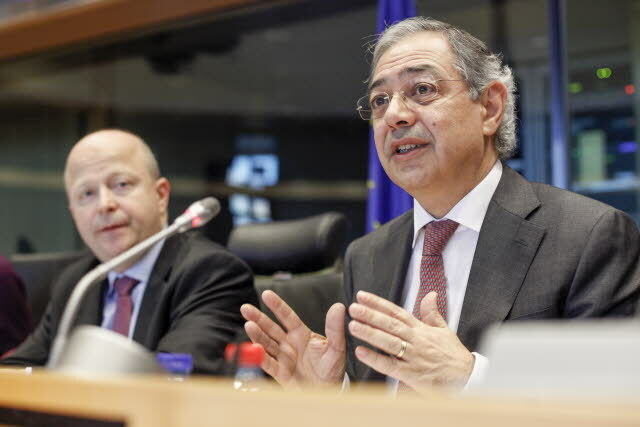 On the right, Vitor Manuel Da Silva Caldeira, president of the Court, and Michael Theurer, Chair Group of the Alliance of Liberals and Democrats for Europe (EP Audiovisual Services). All EU member states budgets including the EU’s proper one will be under scrutiny this week in Brussels. Let’s start from the Union’s own budget for 2014. Today Monday, a Conciliation Committee, made up by the 28 representatives of the member states and 28 European legislators, has to agree on EU’s budget for 2014. Earlier today (before the Conciliation Committee meets) the ECOFIN-Budget council will be convened to formulate the 28 member states’ position on 2014 EU budget. Then, later on in the week, on Friday 15 November, Vice-President Ollie Rehn will hold a Press conference with the budgetary surveillance announcements, thus publishing the Commission’s opinion on the draft Eurozone member states budget plans. Rehn will also communicate the Commission’s assessments of member states action to correct excessive deficits and economic partnership programmes. Starting with EU’s budget proper, the ECOFIN Budget Council will commence its work early today by providing guidance to the Lithuanian Presidency for the negotiations with the European Parliament in view of the meeting of Conciliation Committee which will take place later in the day. The European Parliament is looking to increase the payments in the 2014 EU budget by EUR 1.3 billion and the commitments by EUR 855 million, as compared to the Council’s position. If there is no agreement in the Conciliation Committee today, there is a deadline of two more days to achieve a deal. In the event that there will be no convergence of positions between the Parliament and the Council until Wednesday 13 November, when the conciliation period expires, the Commission must submit a new draft budget for 2014. If the new budget is also rejected, the EU will be financed by the so-called provisional-twelfths arrangement. As the European Sting writer George Pepper observed last Friday, “this entails that budget appropriations per month will be limited to one twelfth of the amount in the 2013 budget or of the draft budget for 2014, whatever is the lower”. Let’s turn now to the other budgets, those of the 18 Eurozone member states. For the first time the Commission is to exercise its new role and rights as provided by the ‘Two Pack’ regulations, while examining the draft budgets of Eurozone’s member states. The Two-Pack comprises two regulations designed to enhance fiscal austerity in euro area Member States. In this way, the new economic governance environment of the EU in general and the Eurozone in particular has been institutionalised. The two regulations build on and complement the Six-Pack reforms to the Stability and Growth Pact (SGP), the European framework for fiscal surveillance, and the European Semester for economic policy coordination. The first of the Two-Pack regulations applies to all euro area Member States, with special rules applying to those in the corrective arm of the SGP, the Excessive Deficit Procedure (EDP). The Commission is elevated to a position of not only judging if the draft budgets of member states are in order, but it is also empowered to issue corrective directions and probably also penalties in cases of non-compliance. To this effect, this Friday 15 November, the Commission will publish its judgment on the action taken by certain member states under the Excessive Deficit Procedure (EDP). The Commission will also issue its opinions on the “economic partnership programmes”, submitted by euro area member states under the EDP. Those programmes are another novelty of the new economic governance system, setting out structural reforms to be undertaken to correct the fiscal deficit in a lasting way. In short, this Friday the Commission can actually rewrite the budgets of those Eurozone countries, which are not in conformity with the demands of the SGP. Without the green light from the Commission, the budgets of the 18 Eurozone member states cannot be introduced to national parliaments for approval. On top of that, the Commission can issue ‘instructions’ on structural measures to be undertaken by the non-complying member states. More or less, once a member state is judged by the Commission as moving outside the SGP lines, then this member state’s economic and structural policies will be decided in Brussels, as it is the case of Greece, Ireland and Portugal. Undoubtedly, the EU’s and the member states’ budgets are the most crucial issues, not only for the European economy, but for very many political, social and strategic determinants. In this respect, this week may prove quite significant for the future of the European Union.